When it comes to the adults behaving badly style of comedies, The Hangover is the benchmark with many of its predecessors, including its own sequels, never reaching the heights of that film, mainly because the characters are too obnoxious of the humour is lacking or it’s just badly made, badly acted and just plain bad. Last year’s Bad Moms managed to mix the gross-out humour with a little heart and was enormously enjoyable. 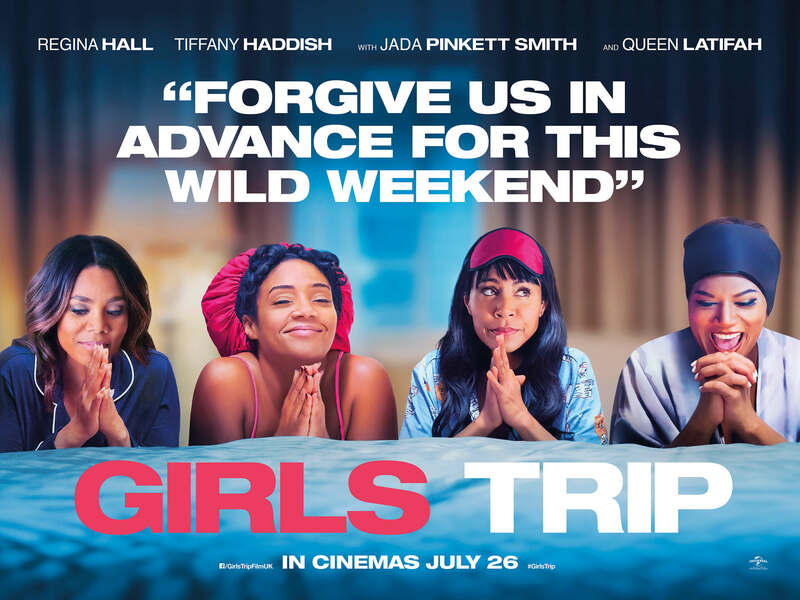 This year, it seems, Girls Trip has done exactly the same, a comedy that manages to shock yet never to the point of disgust with characters I genuinely enjoyed spending time with. Ryan Pierce is a successful lifestyle guru who has formed a powerful brand with her husband, Stewart. Yet she longs to recapture her college days with her three friends, who were known as the Flossy Posse. She decides to invite them to a festival in New Orleans, where, for one weekend, they can let down their hair, drink heavily and have immature fun. Yet the girls, Sasha, a gossip columnist, Lisa, a controlling mother and Dina, the only one wild and crazy enough not to care, have their friendship stretched when Ryan’s personal life comes under scrutiny. I was very late to the party, missing the various screenings for this on the grounds of other, bigger films arriving and me thinking this would come and go without anyone noticing. I was very wrong. This has been a huge success in the UK, becoming the sleeper hit of the Summer. One month in the cinemas and it’s still going strong, which is a great achievement in a year when so many films have failed to connect to its audience. The reason I believe is that this has universal appeal to a demographic of women. These are the antics of strong women, who, for a few days, want to enjoy themselves the way that they did when they first met. Let’s face it, we all long to capture those days when we didn’t have a care in the world and all we wanted to do was have fun. Yet while the film is littered with gross out moments (the zip line scene when one of the girls is left dangling over the busy New Orleans street, only for her wanting to use the bathroom is funny and mildly disgusting), those moments never go so far as to make you feel dirty for watching it, as they do in, say, Dirty Grandpa! There is a tight rein placed on those moments that allow the audience never to be truly offended. There’s plenty of jokes about male anatomy but it never becomes incredibly sexist and homophobia just doesn’t exist in this world. Drugs do make an appearance but even then it’s handled really well. No hard stuff but a bottle of absinthe, producing some very funny after effects. Where the film really scores points is its treatment of friendship. These girls have gone through those days when they were always by your side and then you never see them. They have a history that finally broke them apart but the joy is watching them support each other through their hour of need and that bond they have. Sure, it nose-dives into sentimentality but by the time it reaches that final you expected to happen, you find yourself so emotionally attached to these ladies that you are genuinely moved. It helps that the cast work well together. Regina Hall as Ryan is terrific as this woman convinced she is stronger than she really is, while Jada Pinkett Smith delivers some terrific comic punches. Tiffany Haddish is funny but she does tend to grate after a while and you do wish she would rein it in, which, thankfully by the end, she does. 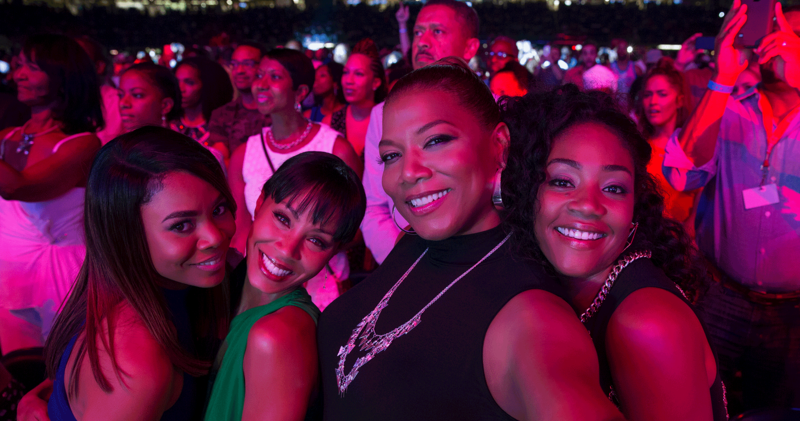 Girls Trip was a surprising delight. Not offensive to the point of vile, yet with some decent belly laughs along the way. It won’t ignite the comedy world but I’m glad it has done so well and I really did enjoy spending time with these less-than lovely ladies.